Looking for a job in San Benito County California? The following is a directory of San Benito County CA top employers with direct links to the jobs they offer. This directory includes local city job links as well as the larger job posting boards. San Benito County's primary cities for this review are Hollister and San Juan Bautista. Only sources that have job listing pages, business directories, and/or legitimate human resources contact listings are provided below. 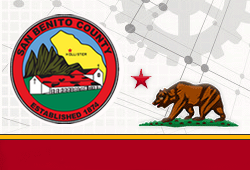 San Benito County is a great resource with an ongoing variety of positions available. During review there were listings for Account Clerk, Assistant Chief Probation Officer, Deputy Agricultural Commissioner/Sealer of Weights & Measures, Eligibility Specialist, Mental Health Clinician, Peer Advocate, Public Health Nurse, Sheriff's Deputy Lateral, Social Worker Supervisor, and Supervising Public Health Nurse. Check for current job listings. The City of Hollister periodicaly posts open positions on their site when vacancies exist. Openings found had included Animal Control Officer, Maintenance Worker, Police Officer, Reserve Police Officer, AB Official, AS/AB Scorekeeper, AS/ASA Umpire, and Youth Sports Official. During review, the City of San Juan Bautista had been hiring for the position of Library Technician. Check for updates. The San Benito County Chamber of Commerce can be a good resource to use for exploring local businesses by using their member directory. The chamber also has a job board that may periodically have listings posted. Hazel Hawkins Hospital is a 62-bed acute care hospital located in beautiful Hollister, CA. Hazel Hawkins Memorial Hospital offers exciting careers with competitive compensation and benefits packages. Here you may find open positions available such as Per Diem Nursing Jobs, Registered Nurse RN, Certified Nursing Assistant CNA, Certified Diabetes Educator, Clinical Dietitian, RN Staff Nurse Home Health, Registered Nurse RN ICU, Medical/Surgical Registered Nurse, House Supervisor, Respiratory Therapist, and Radiologic Technologist. San Benito Health Foundation fulfills the healthcare needs of the community in the San Benito County area. Here you may find opportunities for Patient Care Specialist, Controller, Accountant, Registered Dietitian, Dental Assistant, Dentist, Family Nurse Practitioner, Family Practice Physician, Health Educator, and Optometrist. San Benito County Office Of Education had employment listings posted such as Supervisor/Groundsperson/Maintenance Worker, Substitute Custodian, Substitute Instructional Aide, Special Education Jobs, Director of Human Resources, School Psychologist, Special Education Teacher, Speech & Language Specialist, Program Assistant, Substitute School Bus Drivers, Substitute Clerical Jobs, Substitute Teacher, Teacher of the Visually Impaired (Itinerant), and School Nurse. Aromas - San Juan Unified School District had a number of open positions available. During review job openings found included Teacher Recruitment and Hiring Pool, Special Education Resource Teacher Mild/Moderate, Cafeteria Assistant, Bus Driver/Custodian, High School Teacher Hiring Pool, Yard Duty, Lunchtime Support Aromas School, High School Science Teacher, Math Teacher, Woodworking Teacher, Speech Language Teacher, and Substitute Teacher. San Benito High School District had listings for Division Chairpersons, Teacher for Specialized Therapeutic Educational Program, Accounting Clerk, School Clerk/Secretarial Center, Bus Driver, Principal's Secretary, Agriculture Teacher, Migrant Evening Program Lead Teacher, Speech and Language Therapist, Coaching jobs, School Principal, Anticipated Mathematics/Computer Science Teacher, Life Science Teacher, Anticipated American Sign Language Teacher, English Teacher, and Life Science Teacher. Willow Grove Union Elementary School District had a listing for Multi-Grade Teacher K-4. Hollister Prep was hiring for the positions of Teacher in Training, Paraprofessionals, K-8 Teacher, Small Group Instructor, and School Psychologist. Chamberlain's had openings listed for Child Care Worker Trainee and Mental Health Therapist. Pacific Point Christian Schools periodically hires for positions such as High School Science Teacher (FT or PT), Junior High Teachers (FT or PT), High School Athletics Director (PT), Part-time yard duty and/or part-time after school extended care, Substitute Teachers - All grade levels, including preschool, and Information Technology/Helpdesk. CalJOBS is a great resource for finding jobs with the ability to list by region and job classification and job title. Highly recommended. This is an excellent resource for finding jobs in the state of California. Be sure to read the directions for searching available vacancies. 1111 San Felipe Road Suite 107 - Hollister, CA 95023 - 831-637-5627. The San Benito County One-Stop Career Center is part of a state-wide network of conveniently located centers providing employment and training services all in one place. CareerOneStop provides Job Services, Unemployment Insurance, Vocational Education, Vocational Rehabilitation, Veterans services, Welfare to Work transitioning, and Youth services. Earthbound Farm is the largest organic greens and produce brand in North America with 1000+ employees. Church Brothers Farms and True Leaf Farms are always looking for motivated people to join our team. Now Hiring! Champions Alternative Recovery is now hiring an Executive Director in Hanford, CA. - Apply Today! Champions is seeking an experienced and passionate individual to serve as the Executive Director for this 70 plus person organization. This is an exciting and unique opportunity for a motivated professional to expand the reach of Champions throughout the community. This individual will lead a variety of therapeutic interventions and various administrative service management functions as well as providing agency oversight for budgets, contracts and funding. Reporting into the Board of Directors, they will serve as a strategic partner that will help drive new and sustainable initiatives. Please send all resumes and cover letters to careers@deltaprimeconsulting.com.